In yet another huge boast for this popular BBC TV character, Mr. Tumble has been officially appointed Comic relief’s Red Nose Day face on the 15th March. The CBeebies show ‘Something Special’ will see this Pre-school favourite feature in the free fundraising packs that will go out to nurseries across the UK. The positive initiative is aimed predominately at nursery, primary and secondary school children in encouraging them to raise funds for less advantaged and vulnerable people both in the UK and overseas. The nursery activity packs include an activity guide, sponsorship form, a learning poster, stickers and balloons. They also include everything that nurseries need to host their own ‘Tumble-tastic’ fundraising party, such as tips, posters and tickets. Melanie Edwards, marketing manager for children’s, BBC Studios. 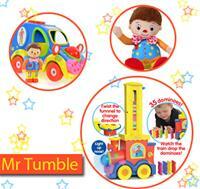 “Something Special and Mr Tumble are firm favourites amongst early year’s children, and we’re sure that the fundraising packs we’ve created with Comic Relief will inspire children to get involved. Now is a great time for retailers to obtain supply of Mr Tumble’s toys given the publicity in the run up to this year’s Red Nose day. Registered account holders will be able to obtain the toys at trade price alongside volume incentives and quick delivery.